Draft: 2013, New York Yankees, 1st rd. Full name is Aaron James Judge…he and his older brother, John, were both adopted…his brother is an English teacher in South Korea…graduated from Linden High School (Calif.) in 2010... Played baseball for three seasons at Fresno State, where he was a three-time All-Conference ﬁrst team selection and a 2013 All-America honoree…in his three years, hit .346 (201-for-581) with 41 doubles, 17HR and 35SB…won the 2012 TD Ameritrade College Baseball Home Run Derby in Omaha…was named a Louisville Slugger Freshman All-American and the WAC Freshman of the Year in 2011... Played for the Brewster Whitecaps of the Cape Cod League in 2012, earning the team's Citizenship Award for being a positive team member... Is the second Yankee to wear No. 99 in a regular season game, joining Brian Bruney, who wore it in 2009... For 2017, was named the New York Player of the Year and selected as the Joe DiMaggio Toast of the Town Award winner, as voted on by the BBWAA…received the awards, along with his 2017 AL Rookie of the Year Award, at the BBWAA dinner in New York on 1/28/18... Finished the 2017 season with the top-selling jersey among all Major League players, becoming the second rookie ever to wear Baseball's most popular jersey (also Kris Bryant in 2015). In 112 games with the Yankees (88 starts in RF, 19 at DH, 1 in CF), hit .278 (115-for-413) with 77R, 22 doubles, 27HR, 67RBI, 76BB and 6SB…the Yankees went 21-6 when he homered in 2018...Was a finalist for the AL Gold Glove Award in RF...Hit .352/.471/.699 (69-for-196) with 47R, 14 doubles, 18HR, 45RBI and 20 multi-hit games in 56 contests at Yankee Stadium…did not go consecutive home games without a hit over a 59-game stretch at Yankee Stadium (9/17/17-7/26/18)…hit safely in 17 consecutive home games from 9/17/17-4/16/18…had at least 1RBI in a franchise-record 14 straight home games from 9/18/17-4/7/18…was tied for the fourth-longest such streak in the Majors since RBI became an official statistic in 1920...Appeared in each of the Yankees' first 56 games of the season (3/29-6/4 G2)...Hit 25HR before the All-Star break, becoming the fourth player to hit at least 25HR before the break in two different seasons as a Yankee and just the second to do so in consecutive years, joining Roger Maris (1960-61), Mickey Mantle (1956 and '61) and Jason Giambi (2003 and '06)...Had a career-long 14-game hitting streak from 9/17/17-3/29/18…had an eight-game streak of drawing at least one walk from 9/24/17-3/29/18, matching the longest streak of his career...Made his first Major League start (and appearance) in CF in 3/31 loss at Toronto...Reached base safely in 23 of his 25 games in April (all except 4/27 and 4/29 at Los Angeles-AL), including each of his first 21 games of the month...Was 3-for-3 with an HR off Red Sox starter Chris Sale on 4/10…entered 0-for-12 with 10K in his career vs. Sale…became the first player to record 3H off Sale in one game since he joined the Red Sox before the 2017 season…prior to Judge, the last player with a three-hit game vs. Sale was Detroit's Miguel Cabrera, who went 4-for-4 with two solo HRs against Sale on 9/5/16 at Chicago-AL...Celebrated his 26th birthday on 4/26…his 63 career homers prior to turning 26 rank 13th in franchise history and are fifth-most in the last 50 years (Mattingly-94, Murcer-77, Jeter-70, Sánchez-71)...Had at least 1RBI in seven straight games from 5/6-13 (14RBI), tying the longest RBI streak of his career (also 7G: 9/24-30/17)...Hit game-winning two-run HR in the 13th on 6/6 at Toronto…was his first career extra-inning HR and was the latest Yankees HR to break a 0-0 tie since Alex Rodriguez's 15th-inning two-run "walk-off" HR on 8/7/09 vs. Boston...Hit game-winning solo HR in the eighth inning on 6/9 at the Mets…was the third straight game the Yankees hit a go-ahead HR in the eighth-inning-or-later, their first time doing so since 8/29-31/77 (three straight - Chambliss, Rivers and Nettles)…Judge hit two of those homers after having just one go-ahead HR in the eighth-inning or-later over his first 239 career games...Started in LF and went 1-for-2 with 1R, 1HR, 1RBI and 1BB in the AL's All-Star Game win on 7/17…his solo HR off Scherzer to lead off the second inning was the first of 10HR hit in the game and the first All-Star homer by a Yankee since Jason Giambi in 2003…became the third Yankee to homer in an All-Star Game at age 26-or-younger, joining Joe DiMaggio (1936) and Mickey Mantle (1955 and '56)…was selected by fans to his second straight AllStar team…is one of five position players drafted by the Yankees to make the All-Star team multiple times as a Yankee (also Thurman Munson, Don Mattingly, Derek Jeter and Jorge Posada)…received a fan-elected starting assignment for the second straight year and is the first Yankee to start at least two straight ASGs since Robinson Canó (2010-13) and first Yankees OF to start two straight since Curtis Granderson (2011-12)...Was 1-for-1 with 1R in 7/26 win vs. Kansas City before being removed from the game in the fourth for PH (Andújar) after being hit by a pitch in the first inning…underwent an MRI at NewYork-Presbyterian Hospital and was diagnosed with a chip fracture of the right wrist (ulnar styloid bone)…was placed on the 10-day disabled list with the injury from 7/27-9/14 (missed 45 team games)…in a simulated game at Yankee Stadium on 9/17, had 11 live at-bats off of RHP A.J. Cole, RHP Chance Adams and minor-league LHP Phillip Diehl...Hit the Yankees' 264th home run of the season with a solo HR in the eighth inning of 9/28 win at Boston, tying the single-season Major League record (1997 Seattle Mariners)…was his first HR since 7/21 vs. the Mets, snapping a 15-game homerless stretch (49AB) and 11-game stretch without a homer since returning from the D.L...Hit .421/.500/.947 (8-for-19) with 6R, 1 double, 3HR, 4RBI and 3BB in five postseason games…homered in each of the first 3G, joining Hank Bauer (1958 World Series Games 1-3) as the only Yankees to homer in each of the team's first three postseason games in a year (note: Johnny Mize homered in 1952 World Series Games 3-5 after missing the first 2G of the Series)…became the third player to begin a postseason with 3G with at least 2H and 1HR, joining St. Louis' Matt Carpenter in 2014 and the Yankees' Hank Bauer in 1958...Hit a two-run HR in the first inning of the Wild Card Game…with an exit velocity of 116.1 mph, was briefly the hardest-hit postseason HR of the Statcast era (since 2015), until Stanton's HR surpassed it later in the game...Set a postseason career high in hits in ALDS Game 1 at Boston, going 3-for-5 with a ninth-inning solo HR. In 155 games with the Yankees (141 starts in RF, 10 at DH), hit .284 (154-for-542) with 128R, 24 doubles, 3 triples, 52HR, 114RBI, 127BB and 9SB... according to MLB Statcast, had a 94.9 mph average exit velocity on balls in play, highest among all Major League hitters…his solo HR on 6/10 vs. Baltimore had an exit velocity of 121.1 mph, setting a record for hardest hit HR in the Statcast-era (since 2015)…received his ﬁrst career Silver Slugger Award... Placed second in AL Most Valuable Player voting, totaling 279 points (2 ﬁrst place votes, 27 second place votes, 1 third place vote)…is the second rookie all time to ﬁnish second in MVP voting, joining Mike Trout in 2012 (won by Miguel Cabrera)…only two rookies (in either league) have won the award: Boston's Fred Lynn in 1975 and Seattle's Ichiro Suzuki in 2001 both won the AL MVP as rookies... Was unanimously named AL Jackie Robinson "Rookie of the Year" by the BBWAA…was the ninth Yankee to win the award and second by a unanimous vote (also Derek Jeter in 1996)…was the only player listed on every ballot... Was named MLB "Rookie of the Year" by Baseball America, the ﬁrst Yankee to win the award since Derek Jeter (1996)…was also named 2017 Sporting News AL "Rookie of the Year," as voted on by a panel of AL players…was selected to the Topps MLB All-Star Rookie Team... Led the American League in runs scored (128, 2nd MLB), home runs (52, 2nd MLB), walks (127, 2nd MLB) and and ranked second in RBI (114, 6th MLB), on-base pct. (.422, 3rd MLB) and slugging pct. (.627, 2nd MLB)…led the Majors with an 8.2 WAR, the highest by a Yankee since Alex Rodriguez in 2007 (9.6)... With a 1.049 OPS, was the fourth rookie in the Modern Era (since 1900) with an OPS of 1.000-or-better: St. Louis' Albert Pujols (1.013) in 2001, Boston's Ted Williams (1.045) in 1939 and Cleveland's Joe Jackson (1.058) in 1911... Had 186 balls hit at least 95 mph, accounting for 55.0% of his balls put in play, the highest pct. in the Majors…hit 7HR with an exit velocity of 117 mph or higher (rest of the Majors: two, both by Giancarlo Stanton)... Became the 13th Yankee to lead the AL (or tie for the lead) in home runs and ﬁrst since Mark Teixeira (tied) in 2009…is the ﬁrst Yankee to lead outright since Alex Rodriguez in 2007... Held at least a share of the AL HR lead every day from 5/28 through the end of the season except one (end of play on 9/6)…hit a total of 39HR in 217 minor league games in 2015-16 (also hit 4HR with the Yankees in 2016)... His 52HR were the most ever by a Major League rookie (Mark McGwire, 49HR in 1987) and surpassed Joe DiMaggio (29HR in 1936) for most by a Yankees rookie... His 52HR were tied with Mickey Mantle (52HR in 1956) and Alex Rodriguez (52HR in 2001) for third-most by a player 25-or-younger in Baseball history, trailing only Jimmie Foxx (58HR in 1932) and Babe Ruth (54HR in 1920)…was the ﬁfth Yankee age 25-or-younger to hit at least 40HR in a season... Tied Mickey Mantle (52HR in 1956) for the eighth-most single-season homers in Yankees history and had the second-most by a right-handed hitter (Alex Rodriguez-54HR in 2007)... Homered against every AL opponent, the ﬁrst Yankee to do so since the AL expanded to 15 teams in 2013... Had 33HR at Yankee Stadium, most by a Yankee in a single season at a home venue in franchise history, ahead of Babe Ruth (32 in 1921)…in 77 home games, hit .312/.440/.725 (84-for-269) with 73R, 10 doubles, 33HR, 68RBI and 62BB... Had seven multi-HR games (all 2HR games): 4/28 vs. Baltimore, 5/2 vs. Toronto, 6/11 vs. Baltimore, 9/10 at Texas, 9/14 vs. Baltimore, 9/24 at Toronto and 9/25 vs. Kansas City)…were tied with several others for fourth-most by a Yankee in a single season (three tied with 8G: Alex Rodriguez-2007, Mickey Mantle-1961 and Babe Ruth-1927)…matched Mark McGwire (7G in 1987) for the most ever by a Major League rookie in a single season…were tied for the ﬁfth-most in a season by any player, age 25-or-younger behind only Ralph Kiner (10G in 1947), Willie Mays (9G in 1955), Reggie Jackson (8G in 1969) and Vladimir Guerrero (8G in 2000)... With Gary Sánchez (four), became the second pair of Yankees teammates, each age 25-or-younger, with at least four multi-HR games in the same season (DiMaggio/Gordon, four each in 1939)... Had 52HR, while Gary Sánchez had 33HR…was just the second time in Yankees history that two teammates, age 25-or-younger, hit at least 30HR in the same season, joining Joe DiMaggio (31HR) and Joe Gordon (30HR) in 1940…with a combined 85HR, set the Major League record for homers by two teammates, each 25-or-younger (surpassed the 2007 Milwaukee Brewers' Prince Fielder-50 and Ryan Braun-34)... According to Elias, was the ﬁrst rookie in Major League history to be the ﬁrst player to reach 20HR in a season (reached on 6/11)…was the ﬁrst Yankees batter to do so since Alex Rodriguez in 2007... Hit 30HR before the All-Star Game, one of two rookies ever to reach 30HR prior to the All-Star break (since 1933), joining Mark McGwire (33 in 1987)…is one of three Yankees ever to hit at least 30HR by the break, joining Roger Maris (33HR in 1961) and Alex Rodriguez (30HR in 2007)…marked the seventh time a Yankee led the Majors in homers at the All-Star break (since 1933): Rodriguez (30) in 2007, Maris (33) in 1961, Maris (27) in 1960, Mantle (29) in 1956, DiMaggio/Keller (19 each) in 1941 and DiMaggio (20) in 1937... The Yankees went 31-14 when he homered in 2017…won each of the ﬁrst 12 such games from 4/9-5/14 (G1)... His 128R were most by a Major League rookie since Mike Trout in 2012 (129R)…were second-most by a Yankees rookie (Joe DiMaggio-132R in 1936)…the Yankees went 58-27 when he scored a run... His 114RBI were most by a Yankee since Curtis Granderson (119) and Robinson Canó (118) in 2011…the Yankees were 44-20 when he had at least 1RBI and 23-5 when he had multiple RBI... Is the fourth rookie in Yankees history with at least 100RBI in a season: Joe DiMaggio (125 in 1936), Tony Lazzeri (114 in 1926) and Hideki Matsui (106 in 2003)... Became the eighth player in Yankees history with at least 100R, 100RBI and 100BB in a season, joining Lou Gehrig (11x: 1926-27, '29-32, '34-38), Babe Ruth (10x: 1920-21, '23-24, '26-28, '30-32), Mickey Mantle (3x: 1954, '56, '61), Charlie Keller (2x: 1941-42), George Selkirk (1939), Bernie Williams (1999) and Jason Giambi (2002)…only Ruth (10x), Gehrig (5x), Mantle (2x) and Giambi accomplished the feat while also hitting at least 40HR…is the fourth Yankee ever with at least 110R, 110RBI and 110BB in a season (Ruth-10x, Gehrig-5x, Mantle-2x)... Joined Boston's Ted Williams (1939) as the only players ever with at least 100R, 100RBI and 100BB as a rookie... Had 38 games with at least 1R, 1RBI and 1BB, most by a Yankee since Lou Gehrig in 1936 (43)... Became the fourth rookie all-time to draw 100BB and score 100R in a season, joining Ted Williams in 1939 (131R, 105BB), Lu Blue in 1921 (103R, 103BB) and Jim Gilliam in 1953 (125R, 100BB)... Is one of three players in Baseball history, age 25-or-younger, with at least 125R and 125BB in a season, joining Babe Ruth (1920, age 25) and Ted Williams (1941 and '42, ages 22 and 23)... His 127BB set a Major League rookie record, surpassing Cleveland's Les Fleming (106BB in 1942) on 9/10 at Texas (credit:Elias)…surpassed Charlie Keller (81BB in 1939) for the Yankees' rookie walk record on 8/9 at Toronto... Is the ﬁfth Yankee in franchise history-and only right-handed batter-with at least 125BB in a season (Ruth-10x, Gehrig-3x, Mantle-3x, Giambi-1x)... Hit .426/.588/1.049 (26-for-61) with 31R, 5 doubles, 11HR, 24RBI and 24BB in 19 games vs. Baltimore…his 31R were the most by any player vs. any opponent in one season since Boston's Ted Williams scored 31R in 1947 vs. St. Louis-AL... Elias notes it's the most by a rookie vs. one team since Joe DiMaggio in 1936 vs. the Browns (31R)…his active 17-game run-scoring streak vs. the O's (since 4/9/17) is the second-longest by any player vs. the Baltimore/St. Louis Browns franchise since 1913, behind Boston's Jimmie Foxx's 19-game streak from 6/1/38-5/9/39…his 11HR were the most by a Yankee vs. a single opponent in a season since 1961, when Roger Maris hit 13HR vs. Chicago-AL and Mickey Mantle hit 11HR vs. Washington-AL…according to Elias, tied Cleveland's Hal Trosky (11HR in 22G vs. Chicago-AL in 1934) for the most homers by a rookie against one team in a single season…his 24BB were the most by a Yankee vs. an opponent since 1959... Was the only Major Leaguer to post an OPS higher than 1.000 in each of the season's ﬁrst three months: April (1.161), May (1.084) and June (1.167)…led the AL in OPS in April and June... Was named AL "Rookie of the Month" for April, batting .303 (23-for-76) with 23R, 10HR and 20RBI in 22 games…was the third Yankee ever to hit at least 10HR in March/April (Alex Rodriguez: 14HR in 2007 and Graig Nettles: 11HR in 1974)…ranked among all AL leaders with 23R (1st), a .750 SLG (1st), 10HR (T1st) and 20RBI (T5th) in April…tied a Major League rookie record for the most home runs in April, previously set by Chicago-AL's José Abreu in 2014 and tied by Colorado's Trevor Story in 2016 (credit: ESPN Stats & Info)…was the fourth Yankee ever to win the award (also Hideki Matsui-June 2003, Robinson Canó-September 2005 and Gary Sánchez-August 2016)... In April, became only the 10th rookie in Major League history with at least 10HR, 10BB, and a .300 batting average in any calendar month…the only other rookies to do so in the last 40 years were Mike Trout (July 2012) and Gary Sánchez (August 2016)…also accomplished the feat in June and September, while Rhys Hoskins did so in August... Posted a .411 OBP in April (in 22G), a .441 OBP in May (26G) and a .481 OBP in June (28G)…became the third rookie in Major League history to have an OBP of at least .400 in April, May and June (min. 75PA in each month): also St. Louis' Albert Pujols in 2001 and Houston's Greg Gross in 1974…became the ﬁfth rookie in Yankees history (min. 75PA) to record a .400 OBP in May, the ﬁrst since Gil McDougald (.457) in 1951... Became the youngest player in Major League history-and the only rookie-to hit at least 13HR through his team's ﬁrst 26G of the season…is the 12th Major Leaguer to do so, and ﬁrst since Seattle's Nelson Cruz (14HR) in 2015…was the second Yankee to hit at least 13HR through 26 team games (also Alex Rodriguez-14HR in 2007)... Collected his ﬁrst career intentional walk-and the ﬁrst by a Yankee under the new rules of the team on defense signaling to the umpire to issue the free pass-on 4/13 vs. Tampa Bay... Hit two-run HR- o n the ﬁrst pitch of his ﬁrst career PA at Fenway Park-in 4/26 win at Boston…was the ﬁrst Yankee to homer in his ﬁrst career PA at Fenway since Cody Ransom on 9/26/08, who homered on each of the ﬁrst two pitches he saw after entering the game as a defensive replacement for Derek Jeter in the third inning…the homer came on his 25th birthday, joining Roger Maris (9/10/66) and Yogi Berra (5/12/47) as the only Yankees to ever homer at Fenway on their birthday…also caught a third-inning foul pop by Xander Bogaerts while tumbling into the right ﬁeld stands…the play was featured as the No. 1 play on ESPN SportsCenter's Top-10... Recorded his ﬁrst career multi-HR game in 4/28 win vs. Baltimore, hitting solo HR in the ﬁfth and two-run HR in the sixth…at 25 years, 2 days old, was the youngest Yankees outﬁelder with 2HR in a game since Melky Cabrera (24y, 254d on 4/22/09 vs. Oakland)…collected his second career multi-HR game in 5/2 win vs. Toronto…at 25 years, 6 days old, became the youngest Yankees outﬁelder with multiple 2HR games since Dan Pasqua (23y, 268d on 7/12/85 and 24y, 217d on 5/22/86)... Was named AL "Rookie of the Month" for May after batting .347/.441/.642 (33-for-95) with 17R, 5 doubles, 7HR and 17RBI in 26 games and leading all AL rookies in BA, runs, hits, HR, RBI and OBP, while ranking second in SLG…was his second straight "Rookie of the Month" honor, having also won the award in April…became the ﬁrst Yankee ever to win the award twice…was the ﬁrst Yankee to win any monthly award in consecutive months since Don Mattingly was named AL "Player of the Month" in both August and September of 1985... Had a career-long 32-game on-base streak from 5/28-6/30, batting .339/.483/.720 (40-for-118) with 34R, 7 doubles, 1 triple, 12HR, 32RBI and 32BB over the span…was the longest single-season streak by a Yankee since Derek Jeter had a 34-game streak to end the 2012 season (8/27-10/3/12) and the longest single-season streak for a Yankees rookie since Charlie Keller in 1939 (40 games)…reached base safely in 42 consecutive starts from 5/28-7/16 (G1), batting .321 (51-for-159) with 39R, 8 doubles, 15HR, 36RBI and 38BB in his starts over the span…was the longest single-season streak by a Yankee since Mark Teixeira (42G, 6/6-7/26/10)... Hit his ﬁrst career grand slam in 5/28 win vs. Oakland, the ﬁrst by a Yankees rookie since Melky Cabrera on 7/5/06 at Cleveland... Was named AL "Player of the Month" and "Rookie of the Month" for June, batting .324/.481/.686 (33-for-102) with 30R, 5 doubles, 10HR, 25RBI and 30BB in 28G and reaching safely in every game…was his ﬁrst career "Player of the Month" nod and his third "Rookie of the Month" honor, having also won the award in April and May…became the ﬁrst Yankee ever to win three consecutive monthly awards and the ﬁrst AL player with three straight "Rookie of the Month" honors in a single season since Chicago-AL's José Abreu in 2014…was the ﬁrst AL player to win three "Rookie of the Month" awards in a row since Mike Trout won four straight from May-August 2012…was the 10th player all time (in either league) to win both awards in the same calendar month and second Yankee (also Gary Sánchez in August 2016)... Was named AL "Player of the Week" (6/5-11) for the ﬁrst time in his career after hitting .500 (12-for-24) with 10R, 3 doubles, 3HR, 6RBI and 6BB/1IBB in six games... Tied a Major League record by scoring at least 3R in three consecutive games (10R total) from 6/10-12…was the sixth Yankee to do so, also: Frankie Crosetti, 8/26-28/1939; Tommy Henrich, 8/25(G2)-26(G2)/1938; Joe DiMaggio, 7/5(G1)-9/1937; Joe Sewell, 7/27(G2)-29/1931 and Babe Ruth, 6/13-15/1930... Hit safely in 17 straight home games from 6/10-7/28 (.379/.461/.864, 25-for-66, 20R, 2 doubles, 10HR, 17RBI, 9BB), matching the second-longest streak by a Yankee at the current Yankee Stadium (since 2009): Carlos Beltrán, 18G (7/19-8/26/15) and Robinson Canó, 17G (5/17-6/17/10)…was the longest home hitting streak by a rookie in franchise history (previous: Hideki Matsui, 16G in 2003)-credit: Elias... His ﬁrst-inning solo HR in 6/10 win vs. Baltimore had an exit velocity of 121.1 mph, setting a record for hardest hit HR in the Statcast-era (since 2015)... Hit his Major League-leading 20th home run of the season on 6/11 vs. Baltimore, becoming the ﬁrst rookie in Major League history to be the ﬁrst player to 20HR in a season…hit solo HR and two-run HR and went 4-for-4 with 4R, 1 double and 1BB in the game…at 25 years, 46 days old, became the youngest Yankee to go 4-for-4 or better with 2HR since Mickey Mantle (24 years, 211 days) went 4-for-4 with 2HR on 5/18/56 at Chicago-AL…his sixth-inning solo HR went 495' (per Statcast), the longest measured HR hit in the Majors in 2017... Through the end of play on 6/11, led the AL in all three Triple Crown categories…since RBI became an oﬃcial stat, was the ﬁrst time a rookie led his league in each of those categories on 6/1 or later (credit: Elias)... Was selected to his ﬁrst career All-Star team after leading the AL with 4,488,702 votes…was the ﬁrst Yankee to lead the AL in All-Star voting since Jeter in 2009…at age 25, was the youngest player to lead the AL in voting since Ken Griﬀey Jr. (24) in 1994…was the leading vote-getter in all of Baseball via the Player Ballot…was the third Yankees rookie elected to start an All-Star Game (Hideki Matsui-2003, Joe DiMaggio-1936)…eight other Yankees rookies were AL All-Star Team reserves: Dellin Betances (2014), Masahiro Tanaka (2014), Willie Randolph (1976), Tom Tresh (1962), Ryne Duren (1958), Bobby Richardson (1957), Spec Shea (1947) and Joe Page (1944)…is the sixth position player drafted by the Yankees to make the All-Star team as a Yankee (Munson, Mattingly, Jeter, Posada and Gardner)... Won the Home Run Derby, defeating Minnesota's Miguel Sanó in the ﬁnal round, 11HR-to-10HR…became the fourth Yankee to win a Derby, joining Robinson Canó (2011), Jason Giambi (2002) and Tino Martinez (1997)…was pitched to by Yankees BP pitcher Danilo Valiente…hit 23HR in the ﬁrst round, topping Miami's Justin Bour (22HR)…in the semiﬁnals, out-homered NL Rookie of the Year, Cody Bellinger of the Dodgers, 13HR-to-12HR…his 47 total homers hit (in 76 swings) were most ever by a Yankee in the Home Run Derby, surpassing Canó's 32HR in 2011 and second-most in Derby history (2016 winner Giancarlo Stanton hit 61)…four of Judge's homers went at least 500 ft…is the ﬁrst rookie ever to win the Derby outright (the Angels' Wally Joyner was a co-champion in 1986)…is the only player ever to win both the College and MLB Home Run Derby... Started in RF and went 0-for-3 for the AL in the All-Star Game on 7/11…was the second consecutive Yankees RF to be an All-Star (Carlos Beltrán)…at 25, was 14 years younger than Beltrán (39) in 2016…was the ﬁrst Yankee to serve as the AL's starting right ﬁelder since Paul O'Neill in 1997... Ended his single-season Major League-record 37-game strikeout streak (7/8-8/20) in 8/22 win at Detroit... In September, was named AL "Player of the Month" (second, also June 2017) and "Rookie of the Month" (fourth, also April, May and June 2017)…hit .311/.463/.889 (28-for-90) with 29R, 7 doubles, 15HR, 32RBI and 28BB in 27G during the month, his most HR and RBI in a calendar month in his career (April: 10HR, 20RBI in 22G / June: 10HR, 25RBI, 28G)…were the most homers by a Yankee in a calendar month since Roger Maris hit 15HR in June 1961…is the ﬁfth Yankee in franchise history to hit at least 15HR in a calendar month, joining Babe Ruth-4x, Joe DiMaggio-1x, Mickey Mantle-1x and Roger Maris-1x…led the Majors in runs scored and walks and led the AL in RBI (2nd MLB), home runs (2nd MLB), slugging pct. (2nd MLB) and on-base pct. (3rd MLB)... Reached base safely in his ﬁnal 25 games (from 9/3), batting .329/.487/.951 (27-for-82) with 29R, 15HR, 31RBI and 28BB…is the second-longest streak of his career (32G from 5/28-6/30/17)…scored at least 1R in 22 of those 25G…ended the season on a career-long 13-game hitting streak (from 9/17), batting .386 (17-for-44)... Hit 9HR over his ﬁnal 12 games (from 9/18) and 15HR over his ﬁnal 25 games (from 9/3)…12 of his ﬁnal 13H went for extra bases (4 doubles, 8HR)... Scored a run in 12 straight games from 9/9-22, the longest streak by a Yankee since Johnny Damon scored runs in 12 consecutive games from 8/17-30/06…was the Majors' longest such streak of the season... Hit 2HR in 9/10 win at Texas…with Gary Sánchez (2HR) also hitting multiple homers, the duo became the fourth pair of Yankees teammates, both age-25 or younger, to each hit multiple HRs in the same game (also Ron Blomberg-2HR/Otto Velez-2HR on 9/23/73-G1 at Cleveland; Charlie Keller-3HR/Joe DiMaggio-2HR on 7/28/40-G1 at Chicago-AL; and Joe Gordon-2HR/Tommy Henrich-2HR on 8/27/38-G2 vs. Cleveland)…collected his 107th walk of the season in the game, surpassing Cleveland's Les Fleming (106BB in 1942) to set the all-time Major League rookie walks record... Was named AL "Player of the Week" for the period from 9/18-24, batting .429 (9-for-21) with 6R, 2 doubles, 5HR, 9RBI and 4BB in six games over the span…was his second career weekly honor (also 6/5-11/17)... Had eight straight games with an extra-base hit (9/20-28), the longest such streak by a Yankee since Johnny Damon had 10 straight games with an extra-base hit from 5/4-14/09 and the longest ever by a Yankees rookie…batted .423 (11-for-26) with all of his hits going for extra bases over the span (4 doubles, 7HR)... Hit his 49th and 50th home runs of the season in 9/25 win vs. Kansas City, tying and surpassing Mark McGwire (49HR in 1987) for the single-season rookie home run record... Made his postseason debut, batting .188 (9-for-48) with 9R, 3 doubles, 4HR and 11RBI in 13 playoﬀ games... His 4HR were the most ever by a Yankees rookie in a single postseason (credit: ESPN Stats & Info) and were tied with Miguel Cabrera (2003) for the third-most by a rookie in a single postseason behind Evan Longoria (6HR in 2008) and Kyle Schwarber (5HR in 2015)…was the 15th player in Baseball history (and second Yankee) to have 4HR in a single postseason at age 25-or-younger (also Lou Gehrig-4HR in 1928)... Made his postseason debut in the Yankees' AL Wild Card win vs. Minnesota, hitting a two-run HR in the fourth…according to Elias, became the third Yankees rookie to homer in his postseason debut, joining Shane Spencer (1998 ALDS Game 2 vs. Texas) and Elston Howard (1955 World Series Game 1 vs. Brooklyn)…was the ﬁrst postseason HR by any Yankees rookie since Hideki Matsui in 2003 World Series Game 2 vs. Florida…both he and Brett Gardner scored 3R, becoming the seventh set of Yankees teammates to each score at least 3R in a postseason game, and only the second since 1962 (Rodriguez/Matsui/Sheﬃeld in 2004 ALCS Game 3 at Boston)... Leapt at the right ﬁeld wall to rob Francisco Lindor of a potential two-run HR for the second out in the top of the sixth inning in ALDS Game 3 vs. Cleveland…according to ESPN Stats & Info, was the ﬁrst time in his career he robbed a homer... Had multiple RBI in three straight home games (ALDS Game 4, ALCS Game 3 and ALCS Game 4), going 4-for-11 with 3R, 2 doubles, 2HR, 7RBI and 2BB in those games…became the second player in Yankees postseason history to record at least 2RBI in three consecutive home games, joining Lou Gehrig (3G, 1928 World Series Game 1 through 1932 World Series Game 1)... Homered in consecutive games (ALCS Games 3 and 4 vs. Houston), becoming the seventh Yankee, age 25-or-younger, to homer in back-to-back playoﬀ games (also Lou Gehrig, three straight; Mickey Mantle, two straight twice; Greg Bird; Derek Jeter; Gil McDougald and Charlie Keller)…was the third Yankees rookie to homer in consecutive playoﬀ games, joining Keller (Games 3-4 in the 1939 World Series vs. Cincinnati) and Shane Spencer (Games 2-3 of the 1998 ALDS vs. Texas)- credit: Elias... In ALCS Games 3-5, became the seventh player (second Yankee) in postseason history to tally at least 1RBI, 1XBH and 1BB in three straight playoﬀ games (Gehrig: MLB-record 4G from 1928 World Series Game 2-1932 World Series Game 1)…in each of his four games from ALCS Games 3-6, had at least 1R, 1RBI and 1XBH, becoming the third Yankee to do so in four straight postseason games (also Reggie Jackson and Lou Gehrig)... Underwent arthroscopic surgery on his left shoulder on 11/20…the procedure involved a loose-body removal and cartilage clean-up, and was performed by Dr. Neil ElAttrache in Los Angeles at the Kerlan-Jobe Orthopaedic Clinic. Baseball America as the Yankees' No. 6 prospect…was also named the IL's "Best Power Prospect" and the league's 19th-best prospect. Split the season with Double-A Trenton and Triple-A Scranton/Wilkes-Barre, batting .255 (122-for-478) with 63R, 26 doubles, 3 triples, 20HR, 72RBI and 53BB in 124 games…led all Yankees minor leaguers in home runs and RBI... Started the season with Trenton and batted .284 (71-for-250) with 36R, 16 doubles, 3 triples, 12HR and 44RBI in 63 games…was promoted to Scranton/WB on 6/22 and batted .224 (51-for-228) with 27R, 10 doubles, 8HR and 28RBI in 61 games…played in the SiriusXM All-Star Futures Game in Cincinnati and went 1-for-4 with 1R…appeared in three postseason games for the RailRiders, batting .364 (4-for-11) with 1RBI and 1BB... Following the season, was ranked by Baseball America as the No. 3 prospect in the Yankees organization, the No. 10 prospect in the International League and the No. 15 prospect in the Eastern League…was tabbed by MiLB.com as an Organization All-Star. Made his professional debut, combining at Single-A Charleston and Single-A Tampa to bat .308 (144-for-467) with 80R, 24 doubles, 4 triples, 17HR, 78RBI and a .419 OBP in 131 games…ﬁnished the season ranked third among all minor leaguers with 89BB…led all Yankees farmhands in RBI, ranked ﬁfth in HR and sixth in batting average... Began the season with Charleston and hit .333 (78-for-234) with 36R, 15 doubles, 2 triples, 9HR, 45RBI and 39BB in 65 games…was named a SAL Mid-Season All-Star…was transferred to Tampa on 6/19 and batted .283 (66-for-233) with 44R, 9 doubles, 2 triples, 8HR, 33RBI and 50BB in 66 games... Following the season, was tabbed by Baseball America as the Yankees' second-best prospect…was also named an Organization All-Star by MiLB.com... After the season, played for Scottsdale in the Arizona Fall League, batting .278 (25-for-90) with 15R, 5 doubles, 4HR and 15RBI in 24 games…was selected to the Fall Stars Game and was named AFL "Player of the Week" on 11/4. Did not appear in a game after being selected by the Yankees in the ﬁrst round of the First-Year Player Draft... Following the season, was ranked by Baseball America as the Yankees' sixth-best prospect. September 14, 2018 New York Yankees activated RF Aaron Judge from the 10-day injured list. July 27, 2018 New York Yankees placed RF Aaron Judge on the 10-day disabled list. Right wrist fracture. October 14, 2016 OF Aaron Judge assigned to Indios de Mayaguez. October 3, 2016 New York Yankees activated RF Aaron Judge from the 15-day disabled list. September 14, 2016 New York Yankees placed RF Aaron Judge on the 15-day disabled list. Right oblique strain. August 13, 2016 New York Yankees selected the contract of RF Aaron Judge from Scranton/Wilkes-Barre RailRiders. August 2, 2016 Scranton/Wilkes-Barre RailRiders activated RF Aaron Judge from the 7-day disabled list. July 9, 2016 Scranton/Wilkes-Barre RailRiders placed RF Aaron Judge on the 7-day disabled list. February 5, 2016 New York Yankees invited non-roster RF Aaron Judge to spring training. July 11, 2015 Scottsdale Scorpions placed RF Aaron Judge on the temporarily inactive list. June 22, 2015 RF Aaron Judge assigned to Scranton/Wilkes-Barre RailRiders from Trenton Thunder. April 7, 2015 RF Aaron Judge assigned to Trenton Thunder from Tampa Yankees. 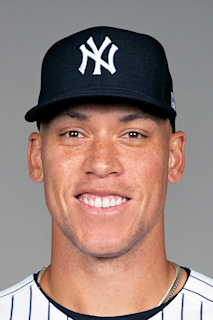 February 5, 2015 New York Yankees invited non-roster RF Aaron Judge to spring training. June 19, 2014 RF Aaron Judge assigned to Tampa Yankees from Charleston RiverDogs. March 31, 2014 OF Aaron Judge assigned to Charleston RiverDogs from Staten Island Yankees. September 27, 2013 Aaron Judge assigned to Staten Island Yankees. July 12, 2013 New York Yankees signed OF Aaron Judge.